Heading is the most important part of a web page, with a headline visitor gives a clear estimate for search bots. A good title briefly describes what the web page is all about. We can use 6 types of titles in one page. For different titles, different HTML title tags are used. Proper use of title tags helps in better SERP results. As a result, your visitors will increase. On the other hand, incorrect use of title can harm your site. Many new webmasters do not know about the top. They often do wrong with the title, I will give a clear idea on using the heading tag. Here I didn’t mention about H5 and H6. These headings should be used for less important things such as Date header, Sidebar Title etc. But many new bloggers are not aware of using header properly. For better optimization we must optimize heading tag properly. Here I am going to talk about Blogspot blogs. In Blogspot Blogs Heading tags are not properly used in default as they should be. See how heading tags are used in Blogger templates. Blogger uses H1 for Blog’s name that is fine. In homepage, Blog Title/Blog Name can be H1 but in post page, post title should be H1. Now about heading 2, H2 for date header or sidebar header is not correct for SEO because they are not so important. Heading 2 should be used for second most important thing which is Post Title. For better SEO result, you must optimize your heading properly. How should we change heading? We use Thesis post styling feature to style blog post which is good but we can’t ignore one of the important aspect of SEO and that’s using proper H1, H2, H3 heading. By default in any SEO optimized theme, post title is H1 tags. So for next sub heading you can use H2 heading, and H3 heading and so on. According to SEO community, it’s a good idea to use your Keyword in H1, H2, H3 Tags. Link to on external high MOZrank source. Being a human being we tend to make mistakes, but we can always learn from our mistakes and errors and try to write quality but also SEO optimized articles. Again an edge over your Competitors! More chances to get better indexed! 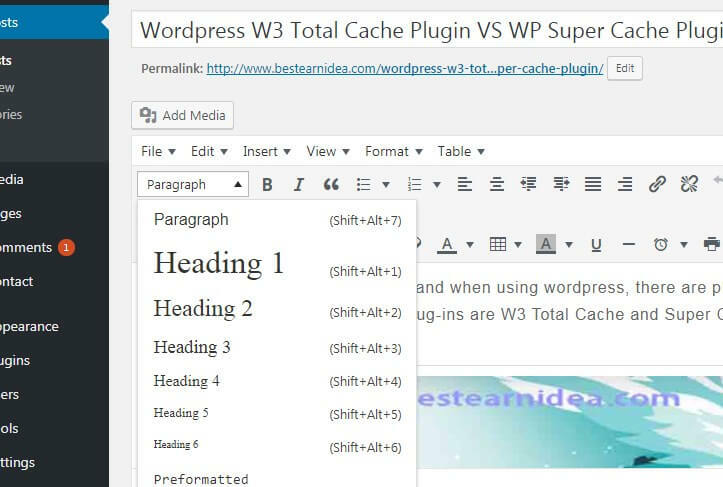 By default, all blogger templates use H1 for homepage title, H2 for blog description and H3 to post titles. Due to the fact that the post titles are the second most important part of your blog after the main title, you should assign them an H2 instead of H3. Search for .post h3 and replace all the occurrences of it with .post h2. You have control of your template’s headers, styles, and formatting in the Cascading Style Sheet (CSS) file usually found under /template-name/css/template.css. Articles in Joomla should always have a title. This title should be assigned style “Heading 1” (H1) and it should contain keywords. You can change it manually on the template on the php file. You can get an extension to do this. You can hide the article (page) title from the “Article Options” (on the side) then add the title manually on the WYSIWYG and apply the Header 1 style with the drop down menu. If you use H1 tag in your title then search engines will easily find out the subject of the post that is why it is recommended to use main keyword in the title because it will help your visitor as well as search engine to understand the topic by the title itself. Some Joomla templates contains H1 tags in the title by default but not all sites have it. You can find many Joomla sites which doesn’t contain H1 tag in the title. Titles as H1: Make sure your page titles are all marked as H1’s. This is done with most templates in Joomla right out of the box, however, not all of them. I’ve also see a few some Joomla websites that have been modified where the titles no longer have H1’s in them. The H1 tag is used by Google’s algorithm to easily detect the subject of the page (along with page title). There are almost countless other things you can do to help improve both your on-site and off-site SEO on your Joomla website. We’ve covered just a few of the less commonly talked about ones. If you have specific questions on SEO, you can comment below or post in the Q&A forum on our website. Bold: You can bold (e.g. [strong]) certain words which are of high importance. Sometimes it’s good to bold your keywords where appropriate. However overdoing this may get you penalized. Italic: You can use the [em] tag to emphasize certain words which will appear in italic. Quote: This is very useful when you are quoting from someone. Headings are important in HTML documents. A heading in HTML is just what you might expect, a title or subtitle. By placing text inside of <h1> (heading) tags, the text displays bold and the size of the text depends on the number of heading (1-6). Headings are numbered 1-6, with 1 being the largest heading and 6 being the smallest. Headings are defined with the <h1> to <h6> tags. Place these lines into your HTML file and you should get what is displayed below. Note: Browsers automatically add some empty space (a margin) before and after each heading. Notice that each heading has a line break before and after each heading display. This is a built in attribute so to speak associated with the heading tag. Each time you place a heading tag, your web browser automatically places a line break in front of your beginning tag and after your ending tag exactly the same as with <p> tags.